Sunday’s outbreak of severe thunderstorms and tornadoes across the U.S. midwest looks set to become the first billion dollar insured loss event caused by severe weather of the month, according to risk modeller RMS. Prior to yesterday’s outbreak of severe thunderstorms, which resulted in reports of 81 tornadoes predominantly in Indiana and Illinois, along with 500 high wind reports, 17 of which were of hurricane strength, as well as numerous reports of large hail, only 818 tornadoes had been confirmed so far this year. 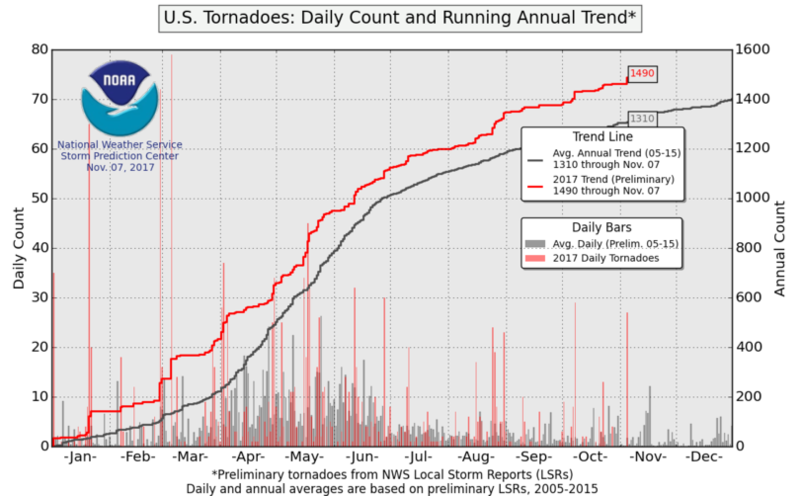 The number of preliminary tornado reports received by the NOAA now stands at 903 for the year, which is significantly below the average annual trend total to November 18th of 1,424 tornadoes, showing just how quiet 2013 has been. Actual versus average numbers of tornadoes reported across the U.S.
Risk modeller RMS said today that the outbreak of tornadoes on Sunday November 17th 2013 may cause an insured loss of greater than $1 billion. 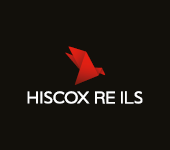 RMS noted that estimates are far from final, but given the devastation that has been seen in pictures and footage from news outlets it is hard to envision the insured loss being much below a billion dollars. RMS highlight two factors which drove the magnitude and severity of the tornado outbreak; unseasonably strong thermodynamic instability and unusually strong wind shear throughout the depth of the atmosphere. One of the tornadoes reported has been preliminarily classified as an EF-4, one of only 20 tornadoes categorised as EF-4 in November since 1950 and third most northerly EF-4 ever recorded. This tornado struck New Minden, Illinois, to the east of St. Louis, MO, and left a damage path which was three miles long. In Illinois, tornado touchdowns have been confirmed by the NWS in Vermilion, Champaign, Tazewell, Woodford, Peoria, Massac and Iroquois counties. Damage has also been reported from severe weather in LaSalle, Wayne, Grundy and Washington counties. In Indiana, affected counties include, Vermillion, Fountain, Newton, Tippecanoe, Knox, Pulaski, Clinton, Howard, Cass, Davies, Carroll, Miami, Martin, Tipton, and Boone. In Kentucky, affected counties include Butler, McCracken, Union, Lyon, Henderson, Hopkins, Muhlenberg, and Christian. In Missouri, affected counties include St. Louis, and St. Charles, and in Wisconsin, Dodge County appears at this time to be the only affected county. The worst affected state appears to be Illinois where tornadoes and powerful thunderstorms have flattened entire neighborhoods, uprooted trees and damaged power lines. Significant tornado damage has been reported in the rural community of Washington in Tazewell County (population ~16,000), located around 120 mi (190 km) southwest of Chicago. Preliminary reports indicate that rows of homes were flattened, though official numbers of damaged buildings has not yet come to light. Preliminary NWS damage surveys have revealed Enhanced Fujita (EF) 2 tornado damage near Coal City (population ~6,000), Grundy County, Illinois, though the full extent of the damage is still to be assessed. In Indiana, according to the state governor, 12 counties have reported widespread storm damage and several people have been injured. The town of Kokomo in Howard County, Indiana has declared a state of emergency through Monday morning local time and schools are to remain closed throughout the day. Sunday’s severe weather and tornadoes could become the second highest insured loss from severe thunderstorm of the year, after the May 18-22 event, driven mostly by the EF-5 tornado that devastated Moore, OK, according to RMS. As we wrote yesterday, ILS investment manager Plenum Investments said that it did not expect any impact to catastrophe bond positions it holds from this tornado outbreak.